Outline: The major part of the script deals with the details of the crucifixion, burial, empty tomb and angel's declaration. It includes briefly the appearance of Jesus to His followers; His command to go into all the world; His going back to heaven to prepare a place for believers; unbelievers will go to the place of suffering. My people, listen while I tell you how it was when they crucified the Son of God. When Jesus Christ was here on earth, He did good to the people. He went from town to town teaching them the Word of God. He healed all who came to Him diseased. He also rebuked the people for their sins. He rebuked the common people and the authorities, too. For this reason many people became angry with Him. However, many people liked what Jesus did and said. They followed Him everywhere. When the authorities saw how the people paid attention to Jesus, they became jealous. One day the authorities, because they were angry and jealous, sent men to capture Jesus. The men caught Him and brought Him to be questioned. The main authority asked Him, "Are you the Son of God?" When Jesus said, "Yes", the authorities became all the more angry with Him. They did not receive Him as the Son of God. They all agreed to kill Him. That same evening they began to mistreat Him. The next morning they nailed Him to the cross. He was still alive then. At noon it became dark all over the earth. At mid-afternoon Jesus died. Then it became light again. At the same time there was a great earthquake. The soldier standing guard said, "Surely this is the Son of God." That evening a follower of Jesus came and took down the body of Jesus. He wrapped it in sheets, as is their custom, and carried it to a tomb which was carved into the rocky hillside. Then they closed the mouth of the cave with a huge stone. 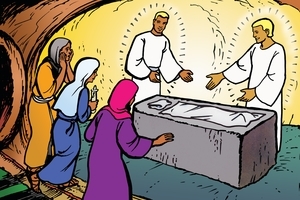 On the third day some women went to the cave to finish preparing the body. When they arrived, they saw that the big stone had been moved to one side. They went in the cave. Inside they saw a young man dressed in shining clothes. They were frightened. But the young man was sent from God and he told them, "Don't be afraid, you are looking for Jesus but He is not here. He is alive. He has gone ahead of you into Galilee. There you will see Him as He told you before." When he finished speaking the women left. Later Jesus arrived where His followers were meeting. Jesus told them, "Go into all the world and tell everyone what I have taught you. People who believe will be saved. People who do not believe will not be saved." After speaking like that, Jesus went up to heaven. He is there to help all who believe in Him. He is also preparing places for us to live in. Some day He will return to take us to heaven. If we believe and obey Him, we will be ready. Those who do not follow Jesus will be cast into the place of fire (suffering). GRN has recorded a version of this script in 480 languages and dialects. See full list.